This piston is designed to execute a WakeOnLAN request from Alexa which toggles a virtual switch which in turn executes an HTTP GET request to a Raspberry Pi running a CGI Script. The script issues a WakeOnLAN magic packet request to the target computer. Note that the Raspberry Pi and the target computer must be on the same LAN for this to work. Note: You will need to go into your computer setup in the BIOS and make sure that Wake on LAN is enabled. In most BIOS this is listed under the Power Management section and it is normally an option for Wake on PCI/PCIe events. Make sure it is enabled. As a second step, the software needs to honor Wake on LAN. 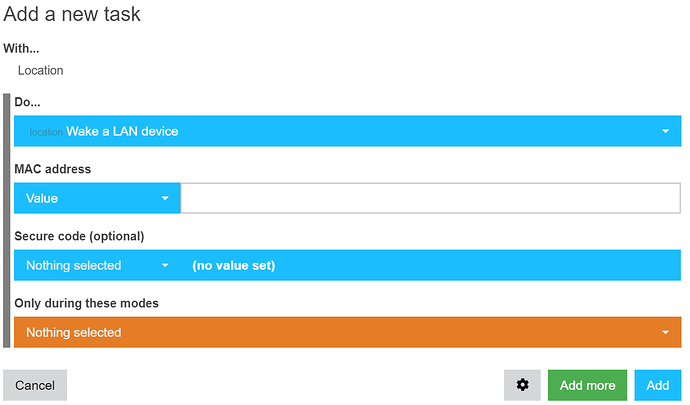 In Windows you can go into device manager and look at the properties of your network controller. Note whether you are using the wired or the wireless controller. Under “Advanced” there should be a checkbox option to “wake on magic packet”. Make sure that is on. In addition, you must enter the Power Management section of your LAN controller in windows and check the option to “Allow this device to wake the computer” and “Only allow a magic packet to wake the computer”. If you are running MacOS, open the systems Preferences tab from the Apple menu. Select Energy Saver from the System Preferences Window or from the top menu go to View > Energy Saver. Put a check in the box called Wake for Ethernet network access or Wake for Wifi Network Access. Look for “Supports Wake on” value. If there is a “g” in there, then Wake On LAN can be enabled. Note that eth0 might not be your ethernet device, in which case you should type “ifconfig” to identify which of your devices is correct. So, you might be entering a device name different than “etho” below. Finally, I go into the “Alexa” app and create a group called “my computer” which contains only the virtual device “Computterroom”. If everything works, your computer should power up magically. If that does not work, check to be sure the address is correct and that the name of your script is correct. Also check to be sure the script is marked executable on the Raspberry Pi with the “chmod” command. Couldn’t you do the same thing without the raspberry Pi? Assuming the hub and the computer to wake are on the same LAN the same virtual switch could toggle the wake on LAN action in WebCore. Personally, I use (for windows) a tool called “sleep on lan” to do the opposite, and shut it off if noone is home. The problem is that Webcore servers run in the cloud and the magic packet must be generated on the LAN. I have a SmartThings V1 hub and it uses ALL cloud services so nothing runs locally. If the destination IP is local, wc will not route it to the cloud. Not if you have a SmartThings V1 hub. To prove it, do a web request to http://api.ipify.org/. The ipify API returns your public IP address. When you run it directly from Webcore, the address returned is the edge server for Webcore. If you have a v2 or v3 hub, then it works as you say. I understand making a web request to ipify.org, what I was referring to is if you make a web call for example to a local pi-hole with a local address. Isn’t that the same thing being done with Wake-On-Lan?